Have you given consideration to getting your Car’s Windows Tinted in Kansas City? Now would be the time. With prices this low, wait no longer. Did I mention life time warranty on film and labor? Still waiting? How about $140 most 4 door vehicles! $120 for 2 door! 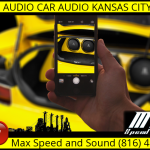 Did I mention Max Speed and sound has been in business 25 years! Still waiting? Call Now Kansas City!